It was a breakfast for dinner kind of night so I decided to make a quiche. 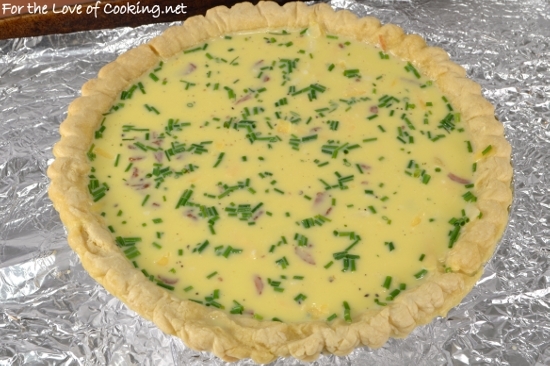 I grabbed a frozen pie crust from the freezer, some eggs, milk, bacon, sharp cheddar, and fresh chives from the fridge. Isn’t great when you can find all the ingredients for a really delicious meal in your pantry/fridge? I love that! 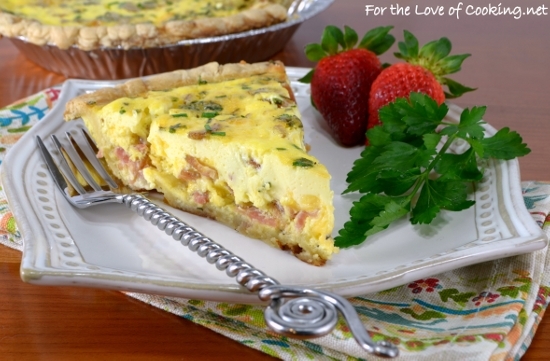 My kids, husband, and I loved this quiche! It was so light and fluffy with great flavor from the bacon, cheese, and chives the the flaky crust was tasty. I ate my piece very slowly so I could savor it… it’s that good! Press tin foil on top of the frozen pie crust and place into the oven to bake for 10 minutes. Remove the foil and continue to bake for 3-5 minutes. Remove from the oven. Place the tin foil on the bottom of a baking sheet. Place the pie crust on top. Cook the bacon in a skillet over medium heat until crisp and cooked. Place on a paper towel to drain grease then cut into crumbles. 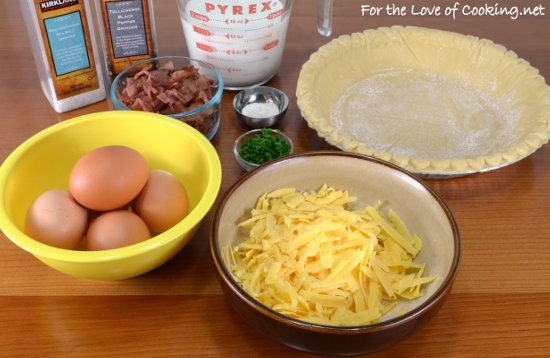 Sprinkle most of the crumbled bacon in the bottom of the pie crust followed by most of the cheese and chives. Add the well whisked egg mixture. Sprinkle the remaining bacon, cheese, and chives on top. I love quiches and this look amazing Pam ! i’m assuming that cheese is freshly grated, and i support that move! the preshredded stuff just doesn’t melt very nicely in any application! Quiche is a go-to meal for me, especially on weekends when I’m working on something and don’t want to spend lots of time in the kitchen. Yours looks terrific. 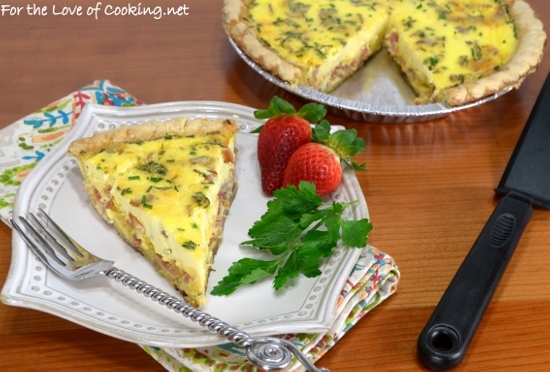 I always thought that quiches should be baked at 325 degrees for a longer time, so the eggs wouldn’t curdle. Don’t you think so? My quiche’s turn out beautifully baked at 375. You should do what works best for you, though. One of my favorite kinds of dinner. Quiche and a salad. Yummy recipe – bacon, cheese, eggs.